January, almost over? Sheesh, I really need to get with the program. I have loads and loads of WIPs and FOs people, so if you can still tolerate my erratic and maddeningly undependable ways, you are in for quite the treat once I get my blogging act together. Yarn: Quince and Co. Lark, 1 skein in "Goldfinch"
Mods: Accidentally doing more cable repeats than called for. I'm an over-achiever! First off, the yarn: ARE YOU KIDDING ME it it so unbelievably soft! Not sure how Quince and Co. has achieved this, but man alive is it luscious. A true joy to knit with. I chose "Goldfinch" but spent about 20 minutes deliberating in my decision-making process because there are many tempting colors. The pattern was an easy, simple knit. Sadly it has only been made by two other people on Ravelry. This is completely surprising to me and I don't quite get it. Is it too plain? Or do people see the pattern and say "please I could do that myself" à la my dad re: every Jackson Pollock painting ever? I am going to give this pattern and yarn combination a sold stamp of personal approval. Yes it's not earth shatteringly unique but is quite pleasing in its utter simplicity. It's solid. Not flashy. Functional. Practical and utilitarian. 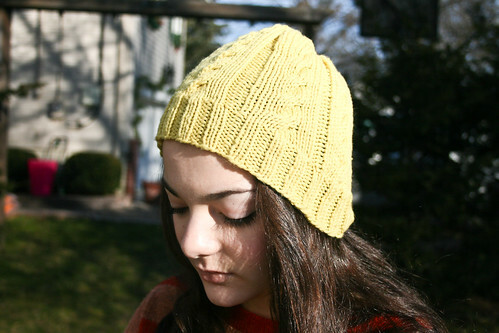 If our Amish pals were ever to make hand knits a part of their 21st century garb and yellow an approved color for outer garments, this hat would be a perfect addition to their wardrobe. Perhaps the pattern should be promoted by the Seamen's Institute as a perfectly cheerful and not too snazzy option for their knitting program? Not sure, but I am quite certain that this pattern has yet to find its niche. Any ideas? I just want you to know that when I need a hat pattern, I come here first and go through the archives. Thank you for your exclusive public service... and good taste! I am dying over your Amish crack. Seriously you are the most hilarious knit blogger on earth. Love this hat! The color is super cute! That is a lovely hat. I like the classic design. You do have a great selection of hats. Do you keep most of them? Very nice! Love the cheery shade of dandelion yellow. 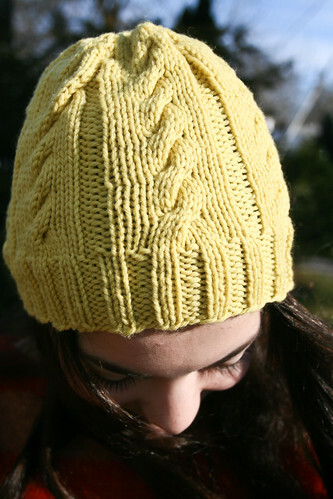 I think the pattern would look especially good with roll-up ribbing (warm ears!). Don't ever change, Heather - I love your erratic and maddeningly undependable ways! Also I love this hat. So perfect!